SEOUL, Nov. 12 (Yonhap) — An exorcist and a doctor, who, by nature, seem completely incompatible, join forces together for one goal — to protect the ones that they care about. In this drama, the network has taken one step further to make South Korea’s first medical exorcism show. At a press promotional event in Seoul on Monday, producer Kim Jong-hyun said “Priest” is different from “The Guest,” the network’s other exorcism series that ended on Nov. 1, in that the previous show combined Korean shamanism and exorcism, while “Priest” is closer to the West’s exorcism shows. “Our show deals with two genres — medical drama and exorcism. It also has many entertaining elements such as action and family love,” Kim said. 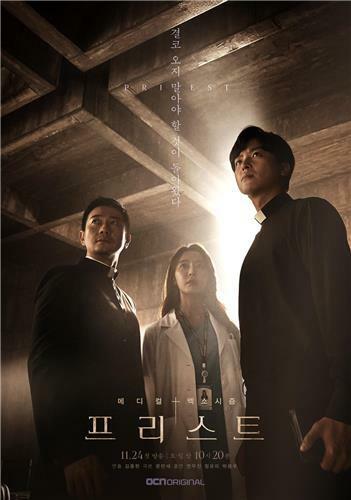 The drama centers around supernatural episodes happening in a Catholic hospital, where doctor Han Eun-ho, played by Jung Yu-mi, works together with two priests, Oh Soo-min (Yeon Woo-jin) and Moon Ki-sun (Park Yong-woo), who perform exorcisms in order to save lives. With different life paths, values and beliefs, the three can’t see eye to eye with each other in the beginning, but ultimately set aside their fundamental differences and join forces together. Park also emphasized the drama’s subject. It will be closely watched by the entertainment industry whether OCN’s latest attempt will get a good reception and successfully add more diversity to the Korean drama scene. The new weekend show is set to premiere at 10:20 p.m. on Nov. 24.